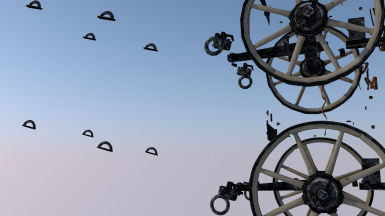 An on going process to improve the models of the game with more polygons , UV edits or just replace them all together. 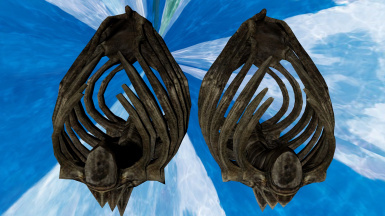 SMIM was the inspiration and the lack of similar mods led me to make this. 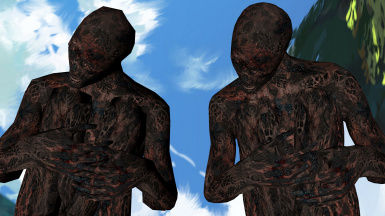 Static Mesh Improvement Mod - SMIM Install but don't overwrite HPP with it. Contact me and we will talk. 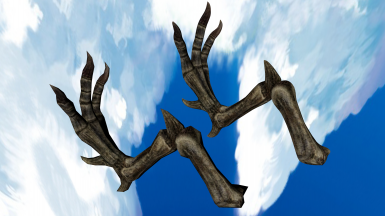 The reason i ask people to overwrite the above mods it's because i keep the best qualities of each mod and combine them with mien aka "best of both worlds" Example: I improved the wall baskets shape and smim improves the hanging feathers of them, so i kept my mesh with the new uvs and transfered smim's new feathers to mien. 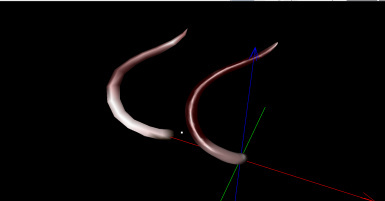 All of the "conflicting" meshes are like that, keeping the shader properties of ELFX while keeping my mesh. 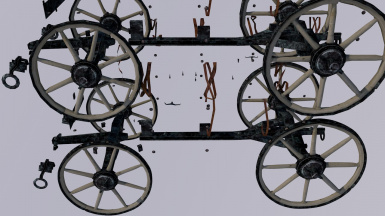 I just wanted to clear that up cause i saw some misunderstandings regarding the reasons i ask people to overwrite them and it certainly isn't because i think my meshes are "superior". 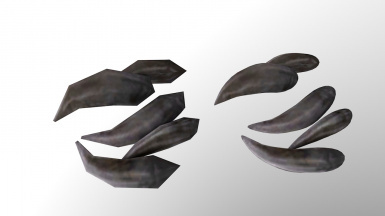 - Fixed missing texture from skeevernests. 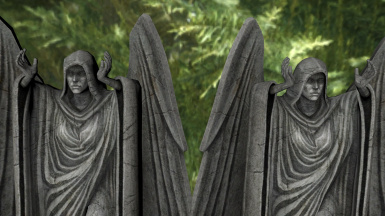 - Fixed bad UV in stonewallong. 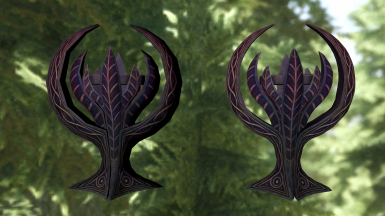 - Added 3d leaf decals in Riften. 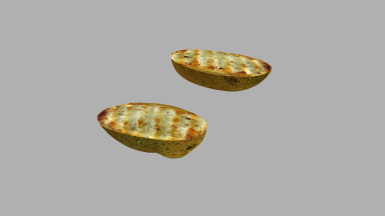 - Added potatobread texture, i am still not sure how the potato bread works. 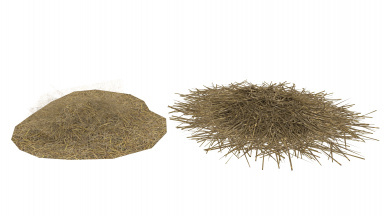 - Optimized/Removed some parts of the scattered hay to ease up the poly strain. 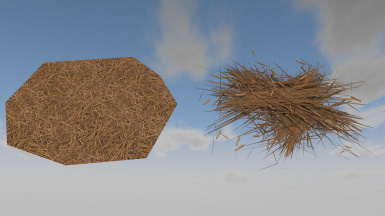 - Improved hay models shading. 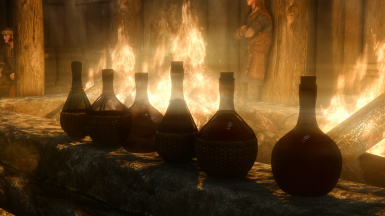 - Improved the alcohol texture. - New green apple model. 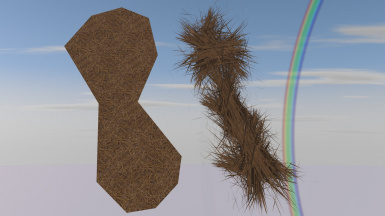 - Added most of the hay skeevernest meshes. 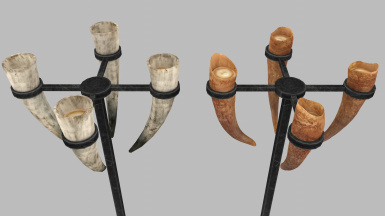 - Added new horn candles for table / wall and floor, i am missing the chandeliers. - Broom hay has a new model. - SMIM is now a requirement. 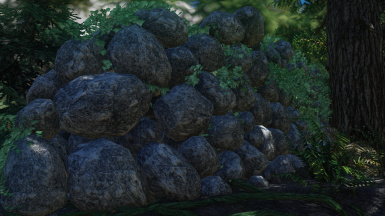 - New redone 3d stonewalls with 3d ivy. 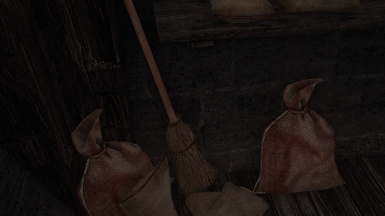 - Added the new broom to the sweeping animation. 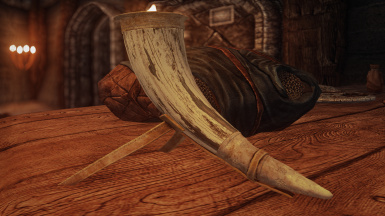 - Fixed dependency on the Windhelm throne, no pelt mods required. 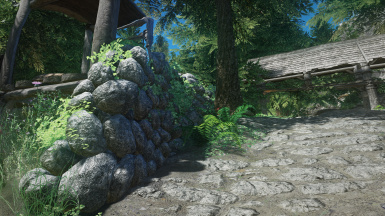 - Added 3d farmhouse stone walls, they will use mountain textures. More to be done. - Added a missing long wall. 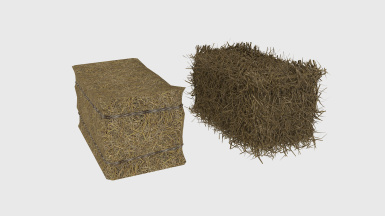 - Added the rest of hay models everything is now done and they are included in the main download. 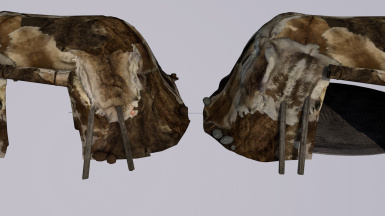 - Fixed Windhelm throne pelt requirement. 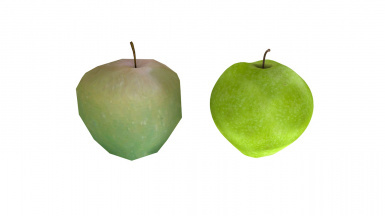 - Improved green apple texture. 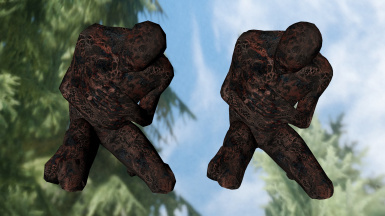 - Removed campfire rocks, use Embers HD instead. 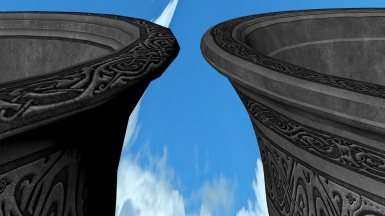 - Removed the exterior nordic stairs because they where problematic and overall not good (i need to redo them). 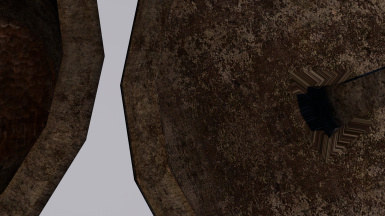 -Added broom model (idle animation broom not added yet). 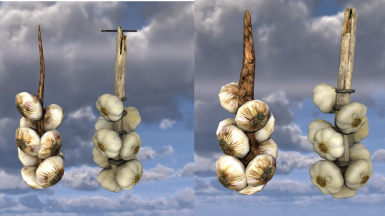 - Minor update, fixed hanging garlic braid thanks to br266 and combined the cabbage with the main download. 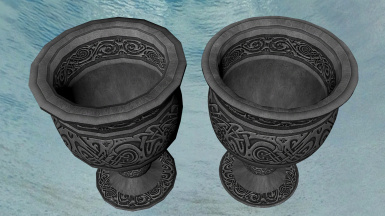 - Fixed wrong normal map being applied to silverbowl01. 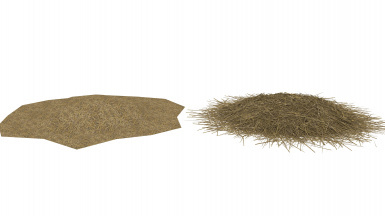 - Fixed wrong size texture for wheat (hay models). 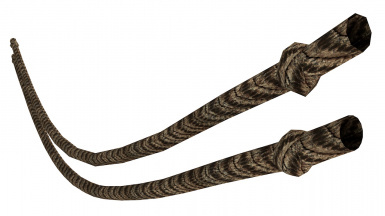 - Added Hanging Garlic Braid with a new wood branch holder , ropes , nail and my HD garlic. 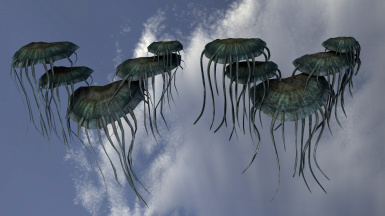 - Removed mod dependencies and fixed purple objects. 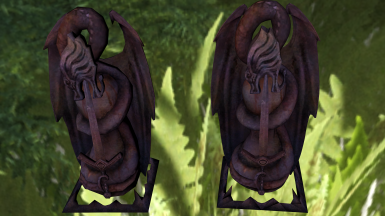 - Fixed wrong normal shading for apples and Windhelm throne, error was made with Nif Optimizer. 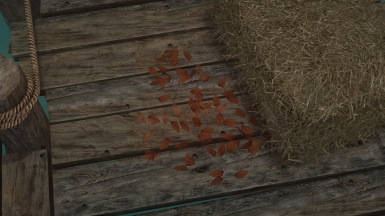 - Added 4k green apple and the wooden skip for the optional pack. 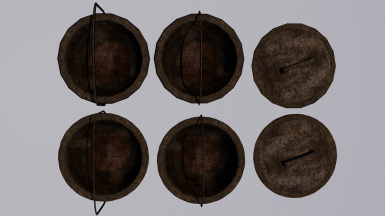 - Fixed cooking pot handles not connecting. 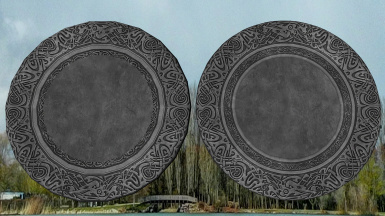 - Fixed tiny polygon error in the apples, also made them smoother. 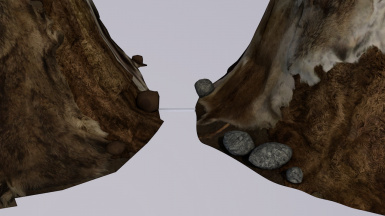 - Added the campfire rocks to a few missed camps plus it should now effect the Campfire mod. 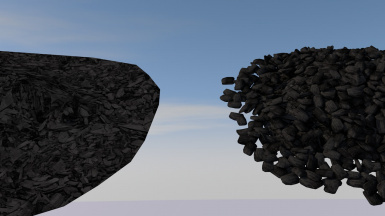 - Added the coal mesh to the rest of skyrim and made it compatible with the SMIM smelter mesh. 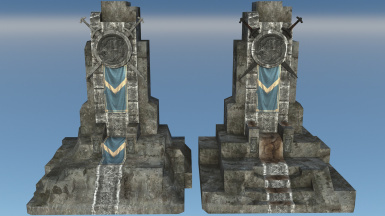 - Remodeled the Windhelm throne featuring a new sensible symmetrical design with new uvs and new normal shading, added real swords and made stone circle smoother, added fur pelt on the sit , steps and arm rest. 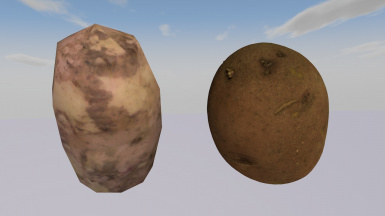 - Added potato replacer model. 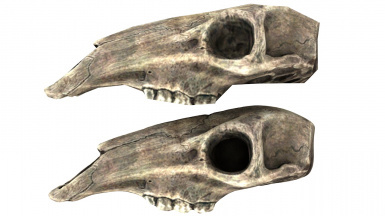 - New HD rocks for all wood campfires lit or not. 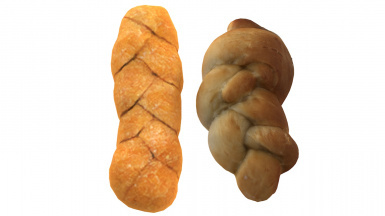 - Added the new bread model to the eating animation (testing needed). - Replaced the green apple model with the red one. 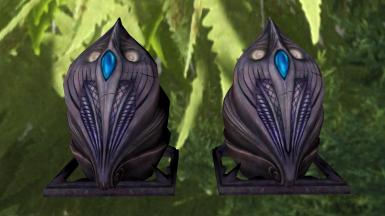 - Restored garlic normal map to 1k (i had made it almost completely transparent in previous versions to fix the shine in game but since i fixed it through shader properties i restored it). 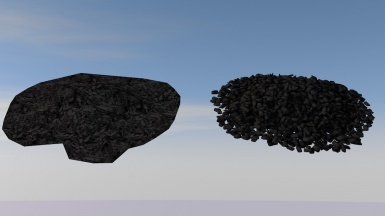 - Added Smelter Coal mesh with the bottom flat part completely removed and added actual coal models on top. 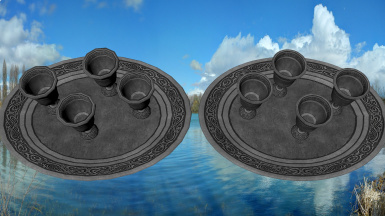 - Fixed/Redid Whiterun fire brazier stand and bowl (closed polygon holes , smoother). 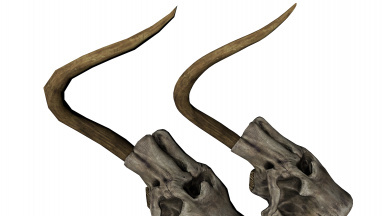 - Added various Hagraven tusks smoothed and added new HD vertex paint. 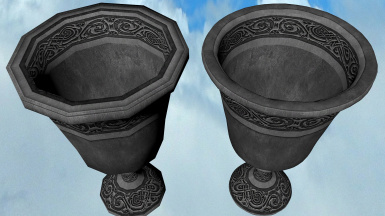 - Fixed hagraven's bowl and blood bowl, it will now use a custom texture. 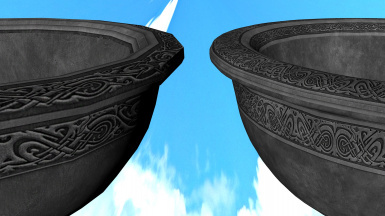 - Added the smim quill feather texture so i won't have to hear about people getting missing textures on wall baskets. - Added glowing mushrooms (cluster, single and ingredients) smoother, with 3d hanging tentacle thingies. - Combined fixes for main download. 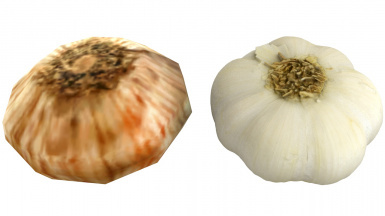 - Normal for garlic is now just 256x256 in scale. 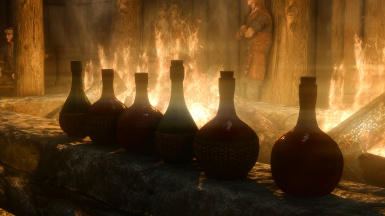 - Added wine bottles (there are more than just the ones in the screenshots) , i replaced the 2d ropes with 3d ones and made the bottles smoother , uv improved , transparent , with a new cork and a liquid inside for the full bottles. 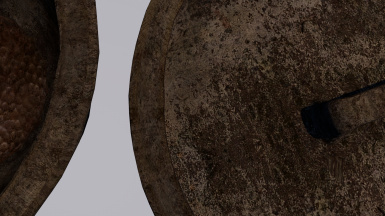 - Redid the textures and normal maps, object should look in game like the screenshots here now. 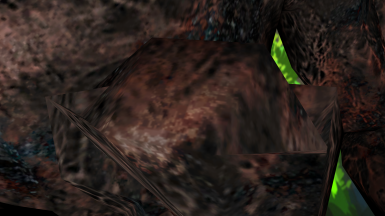 - Redid green apple mesh and textures cause it looked like crap in game, it should look awesome now. 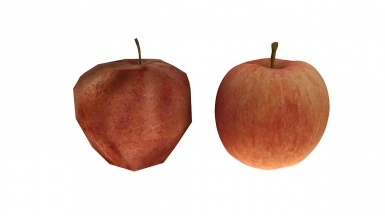 - Added 4k textures for red apple and garlic. 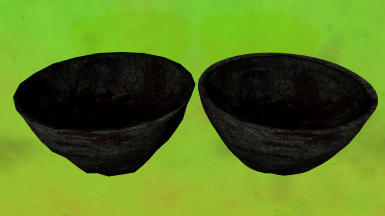 - Fixed a year long bug with silverbowl 01, fixed broken polygon hole. 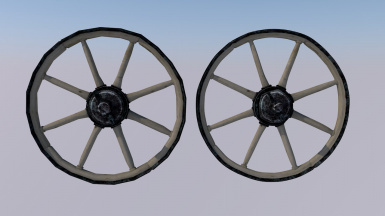 - Added cartfurnstatic01 and wagonwheel01, smooth wheels and metal rings. 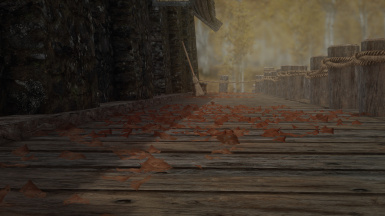 - Resized all 4k textures to 2k. - Fixed wrong folder path for breaded bread. 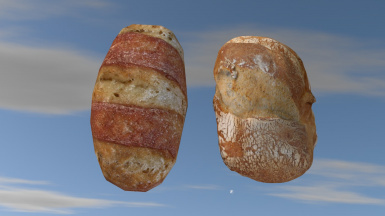 - Added bread models to main download. 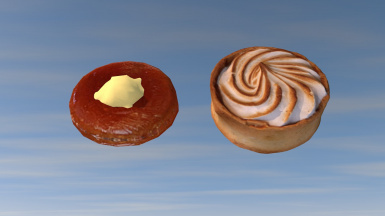 - Added butterscotch candy replacer with 2k textures. 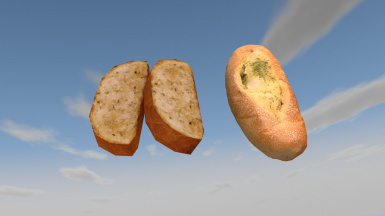 - Added garlic bread replacer with 2k textures. 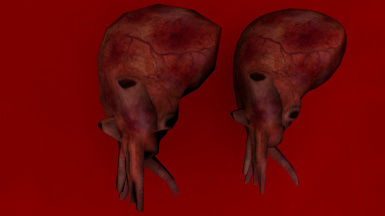 - Remade raw beaf, it shouldn't float now plus improved uvs. 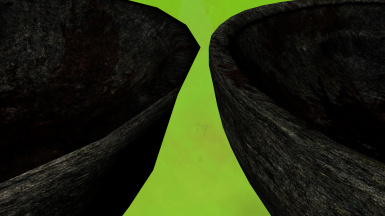 - Fixed textures for garlic. 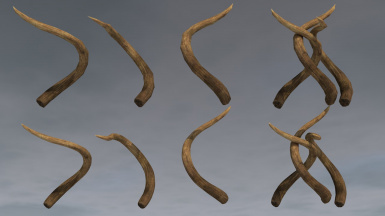 - Remade some normals for less shininess. 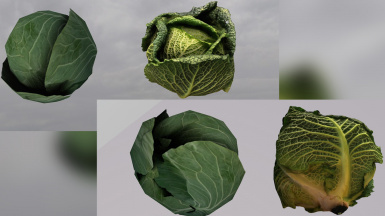 - New models for apples with 2k textures. 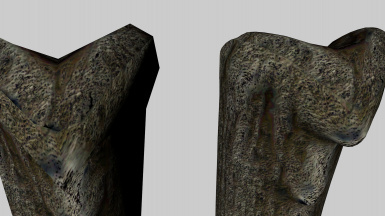 - Nordic strairs smoothed , uv fixed , closed gaps , fixed wrong assigned normal map in one object, new material for stairs. 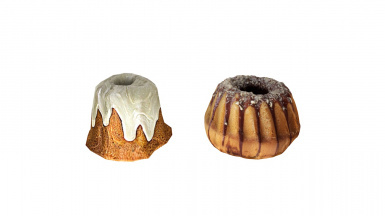 - New more immersive model for the sweet roll with 2k textures. 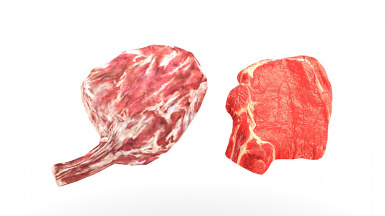 - Fixed raw beef meat collision and it now has proper 2k textures. 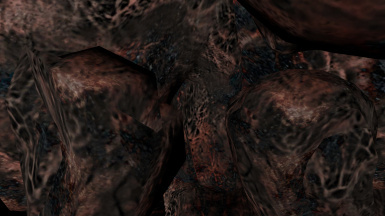 - Added garlic with 2k textures. 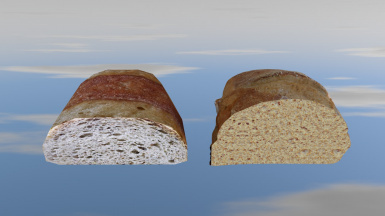 - Added breaded bread with 4k textures. 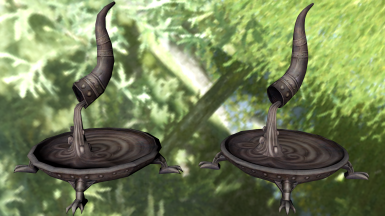 - Added sweetroll with 1k textures. 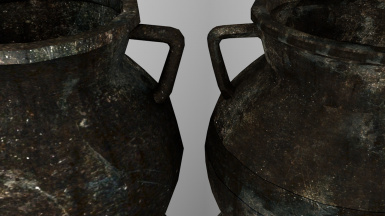 - Updated the mesh normals on all objects. 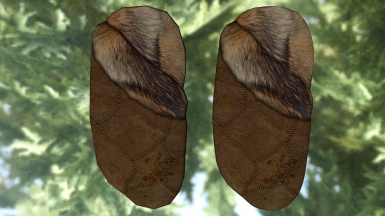 - Ingredient bear claws added. 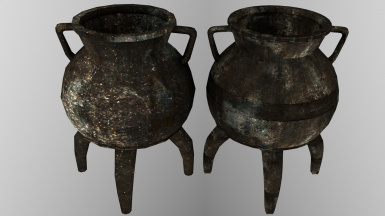 - Cauldron smoothed and uv fixed (kettle used by necromancers and witches). 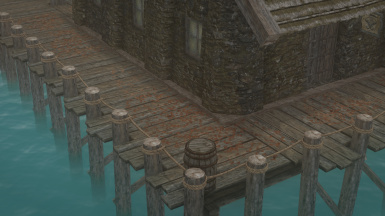 - Solitude hanging ropes , ring and more added. 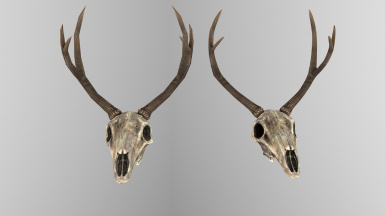 - Static hornless and hornfull deer skulls added and scalped. 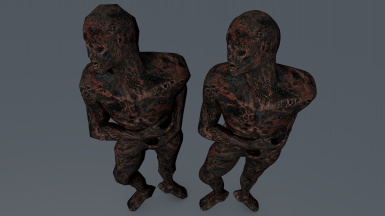 - Optimized burned corpses, it should fix any visual problems or polygon holes. 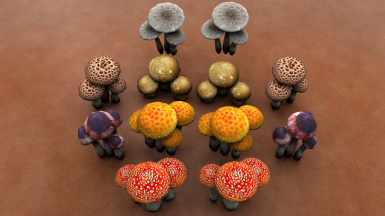 - I re did all the mushroom objects for less visible seams, smoother results and no polygon holes. 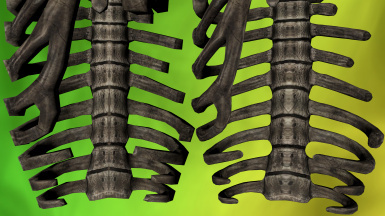 - I re did Mammoth Ribcage for smoother results and less polygons and no visual errors. 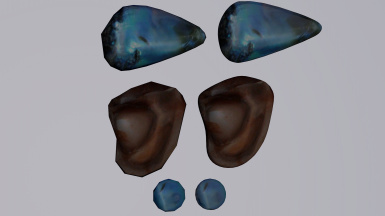 - Silver clutter items added lot's of work done there including UV changes and improvements, check screenshots. 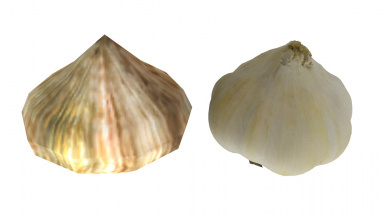 New meshes for the ingredients (clam meat, peal, pearl small). 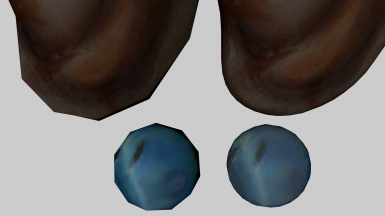 Pearls now got transparency and refraction. 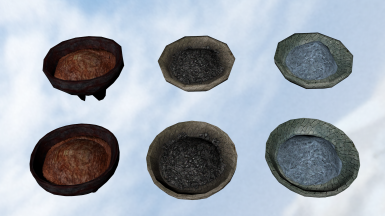 New meshes and UV improvements for (cooking pot, fire spit cooking pots, closed pot lid). 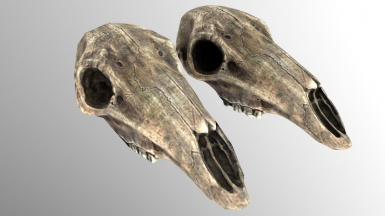 - New meshes for all Mammoth skulls , bones and rib cages. 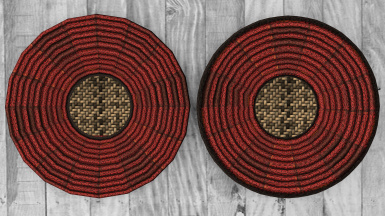 Made wallbaskets compitible with SMIM, so they get the fancy 3d feathers while keeping my smooth shape and uv edits. 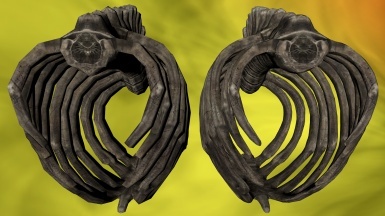 Made deadra heart compatible with skyrim particle patch. 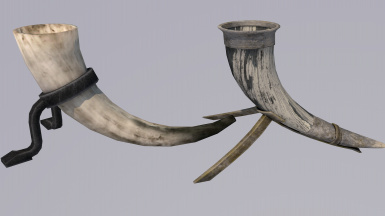 New meshes and UVs improvements/fixes for horker tusk, hagraven bowl and blood bowl, wallbasket one and two large variants. 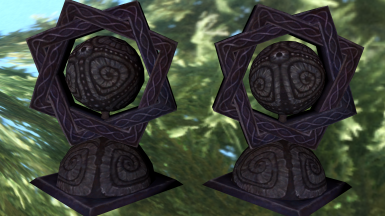 Fixed small holes in Akatosh shrine (hope so). 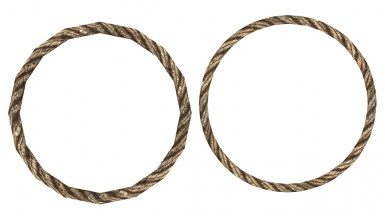 Fixed wrong shader in the rings of NorhitchPost. 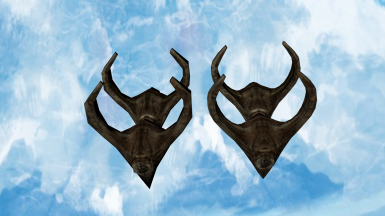 New meshes for Deadra Heart and Beaf Meat. All corpse are now done! 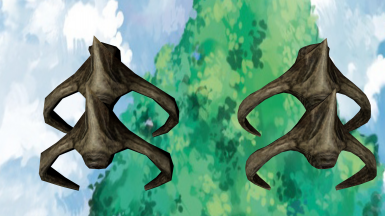 Reupload, fixed polygon holes in some of the latest objects special thanks to Drigger for finding them. Candle mesh temporary disabled until i figure out what's wrong with it. 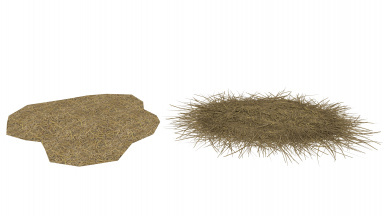 New static mushroom meshes that can be found in farmhouses , ruins , dungeons and more, the ones that can be harvested are not done yet because they are a bit more complicated but they will be done in the next version. 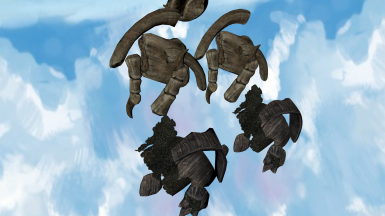 Reupload, fixed wrong file path for the dragon head mount in Whiterun castle. 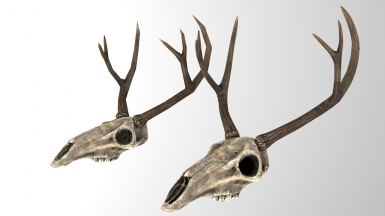 New meshes for all dragon bones found as ingredients and clutter throughout the world, that also includes the mounted dragon head in Whiterun castle above the throne. 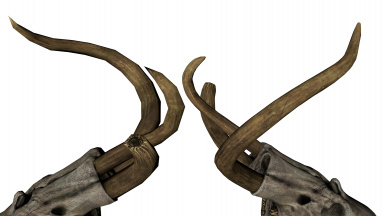 I am not sure if that includes the dragon skeleton that appears after you kill a dragon. 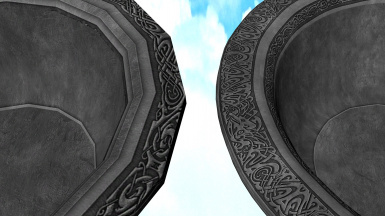 New meshes for the rings found on nordic posts, see pictures. 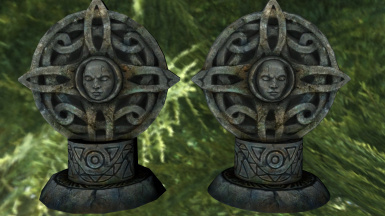 Fixed wrong file path for Meridia's statue. 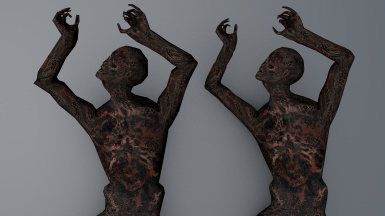 New meshes for burned corpses, not all of them done because they needed more work then i was expecting. 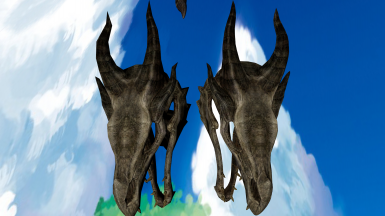 Because these meshes repeat quite a bit the polygons are not too excessive. 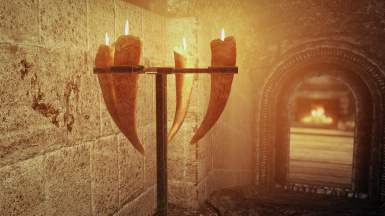 The candle mesh is WIP and doesn't replace all candle meshes yet. 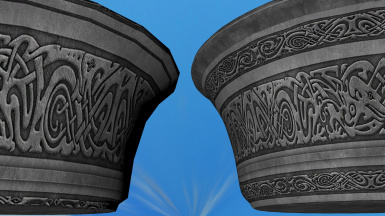 Also the candle mesh is the only object in this pack that doesn't use excessive polygons. 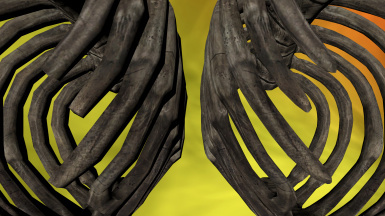 Only a few points and UV edits. - What is the performance hit? Minimal\None reported yet, decent cpu is more important here. 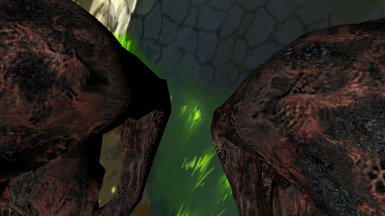 - Your meshes are terrible! They are better than vanilla and that's all i wanted. 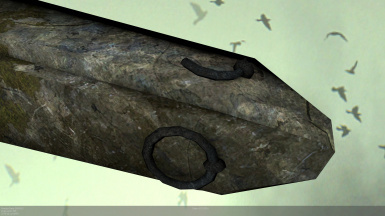 - Why is the polygon count so high? 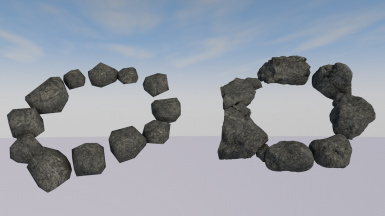 Because the engine can take it, and it's also the easiest way to make the objects smooth and or realistic. 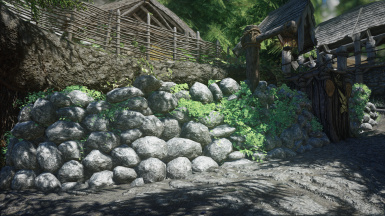 - Oldrim updated version please? 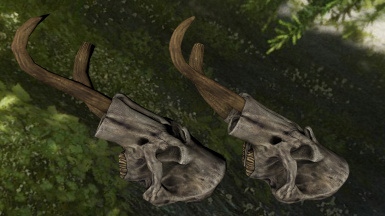 I don't mod things i don't play, join us in SSE. - Can i give you suggestions? Always! Suggestions and constructive feedback is always welcome and needed. 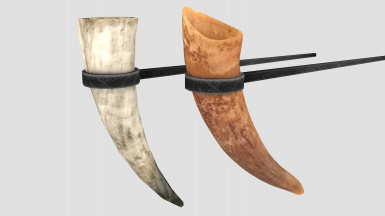 br266 For contributing to the mod development. 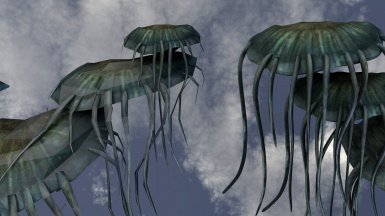 Pherim For testing/helping and being awesome. 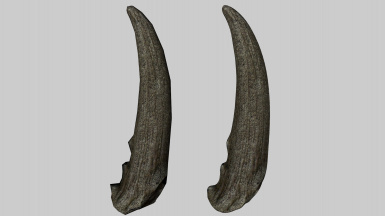 TheFigment For developing the necessary tools. 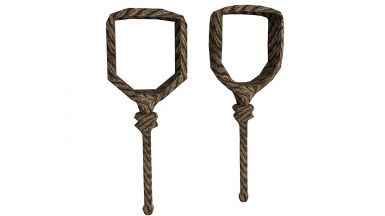 enpinion For developing the necessary tools. 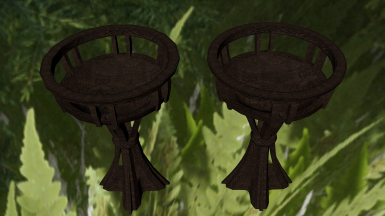 Prometheus For letting me use and modify his assets. 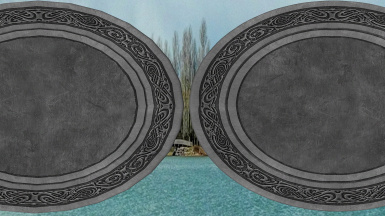 Gamwich For letting me use and modify his assets. 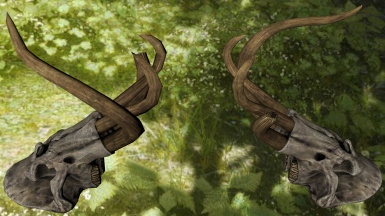 Pfuscher For letting me use and modify his assets.